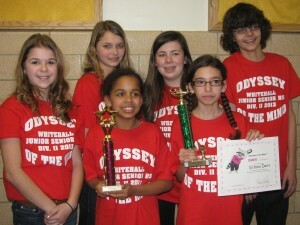 Whitehall’s Odyssey of the Mind team won a regional competition Saturday at Queensbury. The team earned the chance to participate at the state competition in Binghamton on March 23. Pictured are: Jessica Bruce, Courtney Wiskoski, Jazmyn McCall, Morgan O’Dell, Victoria Davis and Logan LaChapelle. Whitehall’s Odyssey of the Mind team is headed to Binghamton after winning the regional competition Saturday in Queensbury. Whitehall finished first among division II teams in the Pet Project and earned a chance to participate in the state competition on March 23. They are the first team from Whitehall to win a regional Odyssey of the Mind event in nearly 30 years. “It’s quite an achievement and it (competing in Binghamton) will be quite an experience for them. I’m happy the kids will get to do this,” said Karen Gordon, who coaches the team alongside Sandy James. Victoria Davis, an eighth grader and one of two students who returned from last year’s team, was recognized for her individual contributions to the team and received the Omer’s Award. The award is presented to an individual who demonstrates outstanding sportsmanship, exemplary behavior, or exceptional talent. Davis was nominated by her coaches and selected by tournament officials. Davis was described as the team’s “go-to girl.” She designed the balsa wood plane for the Tumble-Wood Challenge and rebuilt it twice when it broke during the months of preparation for the competition. The team will now spend the next week preparing for next weekend’s competition. Gordon said the team will compete against anywhere from 17 to 20 different teams from around the state. “It’s on a much bigger scale,” she said. The team plans to tweak a few aspects of its routine. One of the characters from the team’s long term problem will be changed as will the propulsion system on one of its vehicles. Other than that it’s just practicing and making sure everyone remembers their lines. “They’ll put the finishing touches on their long-term problem and work on more spontaneous problems,” Gordon said. The team is scheduled to perform on the Binghamton stage at 1:40 p.m. on Saturday, March 23. The spontaneous part of the project will be held earlier that morning but is off-limits to spectators.